We suggest this itinerary for guests staying in our family holiday homes. The thing with little kids is, they don't like walking around all day. They get tired and bored. So, our biggest recommendation is to get a family ticket for a hop on, hop off bus tour. This will take you around the whole city, showing you all the major sights. City Sightseeing Edinburgh is a great bus tour. You can start at Waverley Bridge and then just get off whenever you like. There's another bus every ten to thirty minutes, so you can re-join the tour when you're ready. There's commentary to listen to on the way, and even a special Horrible Histories version for the children. Here are some places along the route that are great to visit with the kids. The Grassmarket is a medieval market square in the Old Town with the most spectacular view of Edinburgh Castle. There are lots of lovely cafes here, perfect for a big breakfast to start the day. The Grassmarket is also home to Mary's Milk Bar, an extremely popular little ice-cream parlour. The National Museum of Scotland is the best museum in the city centre. Spend the morning here exploring the galleries and try some of these family activities. One of the oldest streets in the city, the Royal Mile stretches from Edinburgh Castle at one end to Holyrood Palace at the other. There is so much to see on this street alone! It's full of historical attractions, Scottish gift shops, cafes and restaurants. If you're looking for a quick lunch, try the Tempting Tattie just off the Royal Mile on Jeffrey Street, for the best baked potatoes in Edinburgh! In the afternoon, visit Camera Obscura and World of Illusions. The Camera Obscura is the oldest tourist attraction in Edinburgh. It also has several newer galleries full of optical illusions and interactive fun. Or, if you have older children, you could step back in time with a visit to The Real Mary King's Close or learn about the story of our planet at Dynamic Earth. All of these are brilliant 5-star visitor attractions. If that hasn't completely tired you out, finish the day with a family dinner at Makar's Gourmet Mash Bar on the Mound. Serving delicious comfort food and Scottish classics. All meals are available in children's portions for just £5. A great way to relax after a busy family day out in Edinburgh. 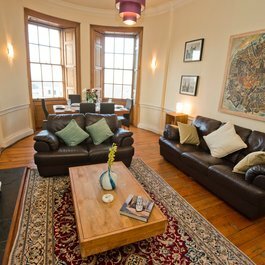 If you're still looking for accommodation for your visit with the kids, browse our range of family holiday rentals here in Edinburgh. And don't hesitate to get in touch if you need any help in planning your visit.